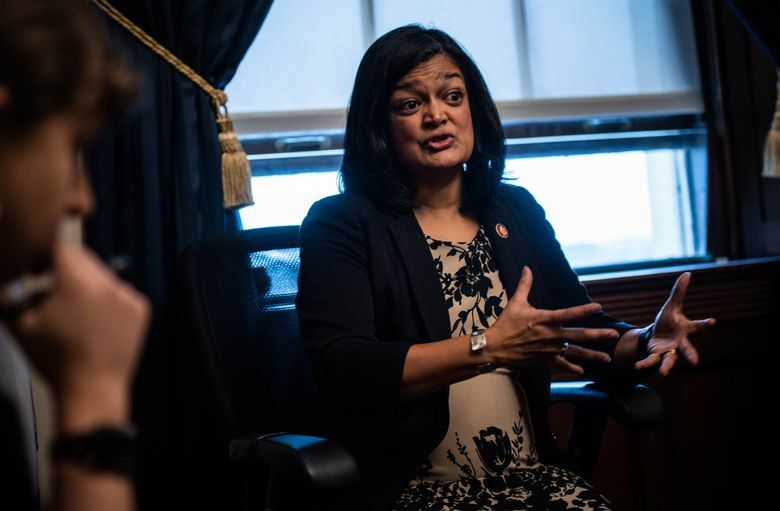 A plan by Rep. Pramila Jayapal, D-Wash., the co-chair of the Congressional Progressive Caucus, would move every American onto one government insurer in two years. (Washington Post photo by Salwan Georges). More than 100 House Democrats on Wednesday plan to unveil a new “Medicare-for-all” plan to provide government health insurance to every American, according to a copy of the bill provided to The Washington Post, as a number of Democratic-leading presidential candidates for 2020 feud over the party’s health-care platform. Rep. Pramila Jayapal, D-Wash., the co-chair of the Congressional Progressive Caucus, is expected to release legislation later on Wednesday that incorporates key policy demands of single-payer activists, aiming to overhaul the U.S. health-care system even faster and more dramatically than legislation proposed in 2017 by Sen. Bernie Sanders, I-Vt., the summary says. The number of Americans who require long-term care is expected to explode over the next few decades as the baby-boom generation reaches advanced ages, with the number of Americans with a disability projected to more than double from 2015 to 2065. Jayapal’s new Medicare-for-all bill, unlike the one Sanders introduced in the Senate in 2017, would guarantee free long-term care, including home health care, for Americans with disabilities as part of the single-payer system. The previous version of the Medicare-for-all bill called for the elimination of all for-profit hospitals, and it called on the government to give financial compensation to providers that would be forced to become nonprofits. That provision was removed from the new Jayapal bill, in part because House aides feared it would lead the government to compensate hospital shareholders. In December 2018, Politico reported that hospitals, insurance companies, and other health care lobbies had launched a unified front to beat back the push for Medicare-for-all, raising the political stakes for Democrats who embrace the plan. Jayapal also said that between 1 million and 2 million people work in the private health insurance system, and that 1 percent of the new Medicare-for-all fund would go to a five-year transition program to pay for pension benefits, job training programs and other assistance for affected workers.